When the UK took the step of allowing gay men and women to serve openly in the armed forces 10 years ago, public opinion was in favour but the armed forces themselves were not. The situation is very similar in the US today. An NOP poll in September 1999 found seven out of 10 Britons believed lesbians and gay men should be allowed to serve in the military. At the same time General Sir Anthony Farrar-Hockley, a leading opponent of the change, told the BBC: "Two surveys have disclosed that the overwhelming majority of those in military service today find homosexuality abhorrent." In the US, a Gallup poll of 1,015 US citizens in May 2009 found 69% in favour of allowing gays to serve openly in the armed forces - an increase of 6% over five years. Support among "conservatives" had jumped 12% over the same period, from 46% to 58%. But a Military Times poll in December 2008 found a majority of active-duty respondents - 58% - were against the idea of repealing the Don't Ask Don't Tell law. Some 10% said they would leave the armed forces if gays were allowed to serve openly. Large-scale resignations from the UK armed forces were widely expected in some quarters, when the ban on gays was lifted - but in practice they did not materialise. At least one British army brigadier publicly resigned in protest, citing "strongly held moral and military convictions" but most observers were surprised at how smoothly the new law - which was forced on the UK government by the European Court of Human Rights - was implemented. "There was this expectation that there would be problems, but it just didn't happen. People just got on with their work," said Dave Small, who was in the Royal Navy at the time, but now works for the Stonewall Diversity Champions Programme helping the three armed services to adopt best practice in the area of sexual diversity. 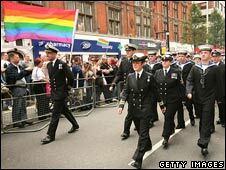 The Royal Navy joined the programme in 2005, the RAF in 2006 and the army in 2008 - the same year it followed the other two services in allowing servicemen and women to participate in Gay Pride marches in uniform. Other landmarks of the last few years include: the first advertisements for recruits in gay-friendly press; the first address by the head of the British army to a Lesbian, Gay, Bisexual and Transgender conference; and the first portrait of an openly gay soldier on the front cover of Soldier magazine, the official publication of the British Army. Fears that allowing openly gay soldiers to serve on the front line would lead to a breakdown of discipline and cohesion within units also proved unfounded. It's the example of British troops operating successfully in Iraq that has prompted the first Iraq war veteran elected to Congress - Democratic Representative Patrick Murphy of Pennsylvania - to campaign for a bill repealing Don't Ask Don't Tell. British Security Minister Lord Alan West, a former head of the Royal Navy, told the Associated Press in July 2009 that allowing gays to serve openly was "much better". "For countries that don't do that - I don't believe it's got anything to do with how efficient or capable their forces will be. It's to do with prejudices, I'm afraid," he said. Like the US, 10 of the 27 countries in the European Union do not allow gay people to serve openly in the armed forces, according to the Palm Center at the University of California - Bulgaria, Cyprus, Greece, Hungary, Latvia, Malta, Poland, Portugal, Romania and Slovakia. This is because the European Court of Human Rights ruling that drove the UK to change its law was the outcome of a specific case brought by four British ex-service personnel. The ruling said that banning gays from openly serving in the military was a violation of their right to privacy under the European Convention on Human Rights. This means that similar cases could be brought against other signatories to the convention, but until then the countries are under no obligation to change their rules. Obama: Letting down gay supporters?